Community groups in Fitzrovia have again won a share of grants offered by one of the neighbourhood’s largest and most active property developers. Property developer Derwent London has awarded grants totalling £66,230 to six local charities as part of its corporate social responsibility. In an announcement last week Derwent London made grants totalling £66,230 shared among six charities to deliver local community projects and raise its profile of corporate responsibility in the face of local criticism. The organisations and projects are: All Souls Clubhouse (After school football club & Clubkicks), Fitzrovia Community Centre (Arts programme), Fitzrovia Neighbourhood Association (Fitzrovia Positive Health), Fitzrovia Youth in Action (Community events programme), and Upbeat Music & Mental Health (Streets of London music workshop and showcase). Derwent a FTSE 250 listed real estate investment trust (REIT) said it was pleased with the quality and range of applications and selected the winning entries “on the basis that they will offer a range of positive benefits — focussing on social, cultural, art and health”. The real estate firm also announced more money in future for local community groups, something that will be received well in the current funding climate. “In addition to the funding allocations this year, the Group are also pleased to confirm an extension to the funding programme, with a further £150,000 which will be allocated from 2016-2018,” it said in a statement. This is the third year that grants have been given since the Community Investment Programme was first announced in 2013 and after Derwent commissioned a survey of local opinion with the aid of public relations company Soundings. The extra funding will bring its total grant commitment to £400,000 over five years. Derwent London plc owns a portfolio of commercial real estate predominantly in central London valued at £4.2 billion as at 31 December 2014, making it the largest London-focused REIT. Derwent is trying fend off a reputation it has for demolishing everything in sight and causing a nuisance with its continuing programme of construction works. It is currently knocking down three buildings in Berners Street and this autumn it will finally start on its largest and most controversial project so far — the redevelopment of the Saatchi building in Charlotte Street. 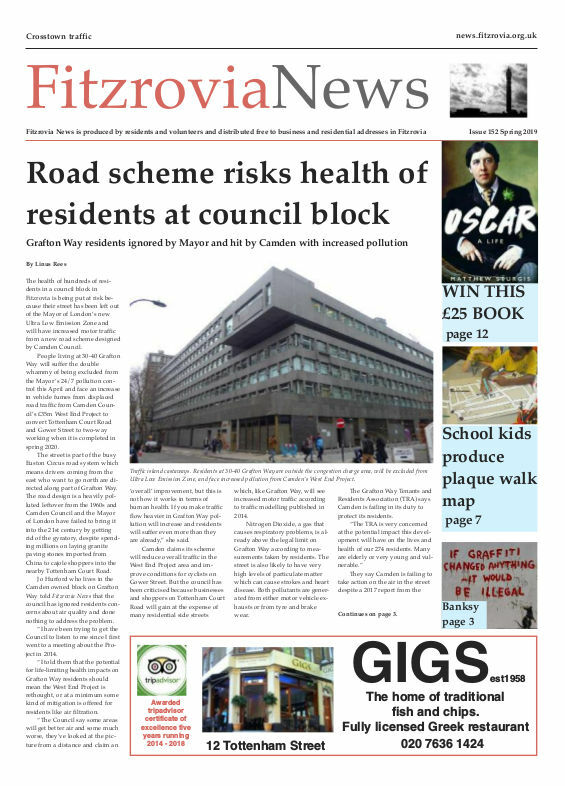 Local residents and businesses are increasingly concerned about the disturbance and disruption caused by demolition and construction, and community groups have complained that there is little local benefit like affordable housing and new public open space being gained. 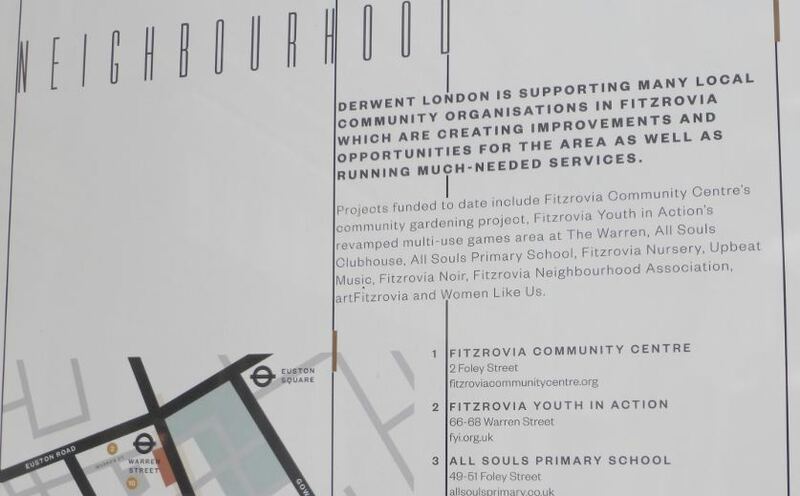 Derwent are by no means the only property developer causing concern but they are one of the larger and more active ones as well as being the driving force behind the Fitzrovia Business Improvement District. 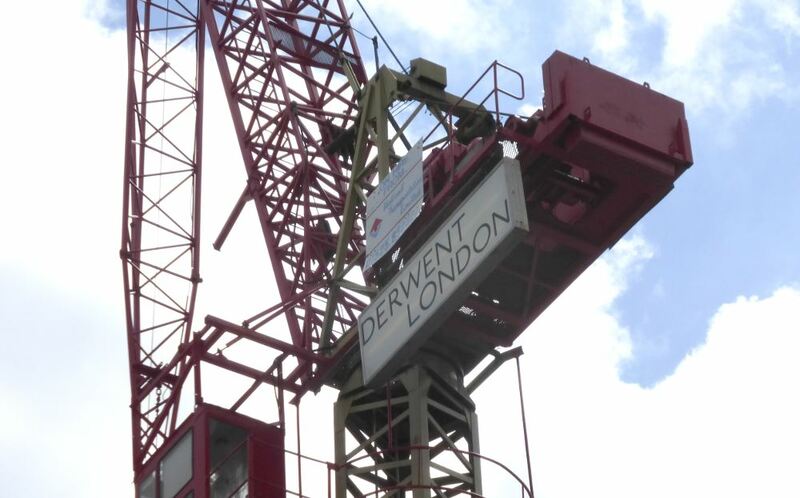 Derwent London is keen to assert its corporate social responsibility credentials. 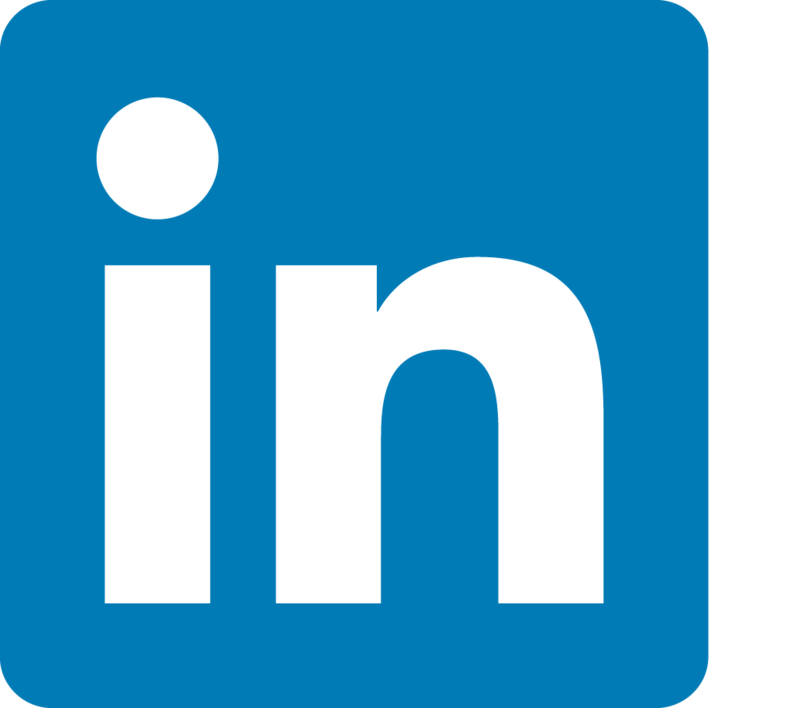 The company is keen to assert its corporate social responsibility (CSR) credentials. At several sites in the neighbourhood it has placed displays saying how it is investing in the local community. Its 2014 annual report includes a note about strategic risks and what action it takes to mitigate these. We can assume they are referring to Fitzrovia News. And under “action” it states: “The Company engages with a number of local community bodies in areas where it operates as part of its CSR activity”. While more grants for community groups will be forthcoming, so will more noise, dust and disruption for some time to come. In another announcement Derwent London today launched its Corner House development at 73 Charlotte Street. Prices for the new homes in a pre-release today start from £1.75m.